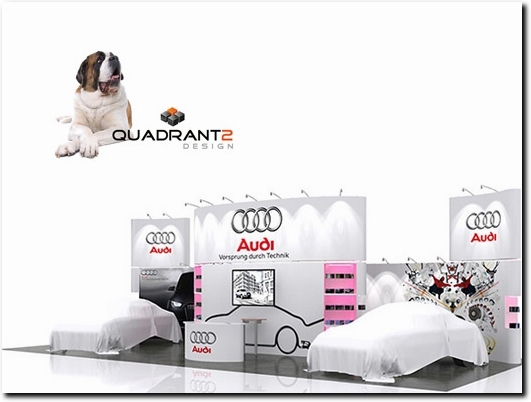 Quadrant2Design are exhibition stand designers who work with one exclusive solution, the Swiss designed Prestige Events System. Prestige creates exhibition stands that retain all the benefits of lightweight modular construction. Prestige stands are flexible and modular, reusable over different events and in different exhibition space. Designs feature flowing seamless graphics, stunning showcase displays and integrated digital screens. Quadrant2Design have all key services in-house including 3-D design and visualisations, stand manufacture, graphics production and exhibition stand pre-builds. The company project manages and installs stands Worldwide. UK (Poole, Dorset) based business - established in 1999 - providing exhibition stand design and build services. Website includes details of services provided, detailed "meet the team" info (via video and page content), work examples, customer testimonials, regularly updated blog, details of business premises, full contact details.